Oh man, as a reader, this is always a difficult week for me. I read a ton of ebooks, so the whole ‘read an ebook this week’ aspect of the event means nothing to me. However, tons of book sellers, publishers and authors have SALES! I end up gluttonously downloading books. I read a lot of them, so it’s not a waste. But I can guarantee I’ll spend collective hours and hours trawling the sales. The subconscious fear of missing something will keep me glued to my computer. *sigh* That I know this doesn’t really empower me to change my behaviour. As an intrepid author, #RAEW doesn’t really mean much to me. I always throw The Weeping Empress up for free on Smashwords, but historically get very few hits. I generally believe a book gets roughly six months of promotion when it’s new and then an author risks being a spammer if they keep it up. So, TWE gets very little promotional attention. But if you’ve ever been tempted to read it, nows a great time to snag a free copy. I’ll be on the lookout for great reads this week. If you have a recommendation or come across a notable sale feel free to drop me a comment. I’m easily swayable in such things. This entry was posted in The Weeping Empress on March 1, 2015 by Sadie. 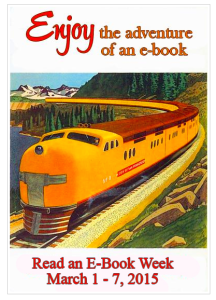 It’s Read and ebook Week at Smashwords! Oh Gawd, I love Smashwords, and what timing! With the introduction of Amazon’s new Affiliate rules I’ve found that the aggregate sites listing free books have started to dry up. Really, what do they expect me to do while I drink my morning coffee? Check my email? As it! 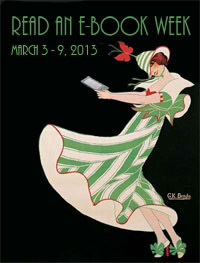 For the rest of the week Smashwords has the perfect solution though, READ AN E-BOOK WEEK. OK, some of them are just free to start with. I admit it. These are the ones from my own Smashwords Library, but there are sooo many more and I’ll probably add a few here and there as I come across authors I’ve read and know are worth recommending. In the mean time, if you have a book participating in the sale feel free to add a link in the comments. I’ll check them out and who know who else might. This entry was posted in The Weeping Empress and tagged books, free, read an ebook week, Smashwords on March 3, 2013 by Sadie.